Catalyst is reducing its carbon footprint by becoming more energy efficient in their production areas. Catalyst recently replaced the halogen lighting in their production area with 44 new, energy efficient LED light fixtures. 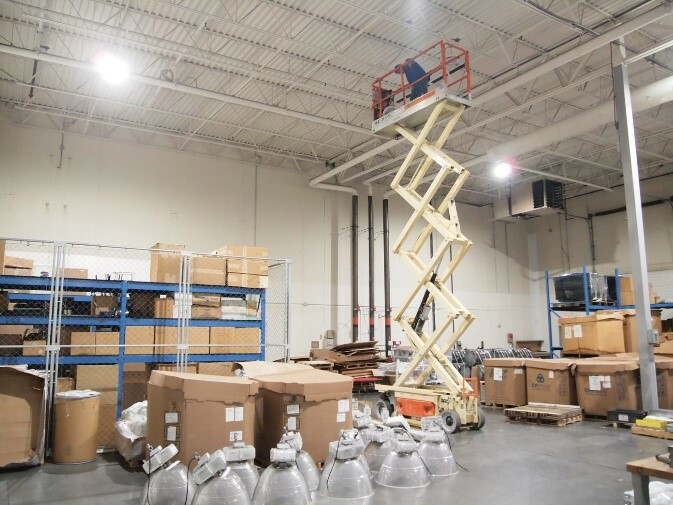 The new high bay LED light fixtures were installed above the CNC and EDM machining centers, over the short-run assembly department, in the injection mold tool room, and the plastic injection mold production areas. Additional lighting was placed in the raw and finished goods inventory areas of the facility as well. Strategic positioning of LED lighting within these specific work areas was critical as proper lighting allows Catalyst team members to complete detailed tasks more quickly and efficiently. The quality of work produced can also be impacted, as clearer lighting allows associates to better review intricate tooling details and molded components more effectively. “Improved lighting in our molding press area allows for better visual inspection of molded components, in real time, by our operators and quality personnel during production runs,” says Production Supervisor, Terry Burks. LED lighting can be up to 80% more efficient than traditional lighting. With LEDs, most of the energy is converted into actual light rather than losing an abundance of energy to heat. This allows for less power to be utilized, supporting the reduction of carbon emissions. Another advantage of converting to LED lighting will be the reduction of maintenance due to the longer lifespan associated with LED fixtures. Frequent bulb and ballast changes were required with the previous traditional lighting which was both costly and labor intensive. The new LED lighting will not require maintenance or replacement for years to come. Though the initial impact of the change is already noticeable by Catalyst’s machinists, mold-makers, plastic processors, and injection molding press operators, a far greater impact will be seen by the environment in coming years as companies like Catalyst do their part to become more energy efficient. Catalyst strives to improve itself in every aspect of design, process and business. It’s a philosophy that transcends not only daily life at Catalyst but every customer relationship and product. Read more about our process on our website or contact us to request a quote for your next innovation project.